Welcome to our first TVP audio interview! Alongside our usual blog posts, we’ll now also run an ‘audio stream’ for sharing informal interviews with friends and colleagues who work on votive offerings (as well as other ‘votive sounds’, from rattly terracottas to religious processions). Please get in touch if you’d like to contribute, or if you have a suggestions for future interview guests or topics. We also welcome feedback on the idea and interview format (which is still a work-in-progress!). Our first interview guest is Professor Jean MacIntosh Turfa from the University of Pennsylvania. 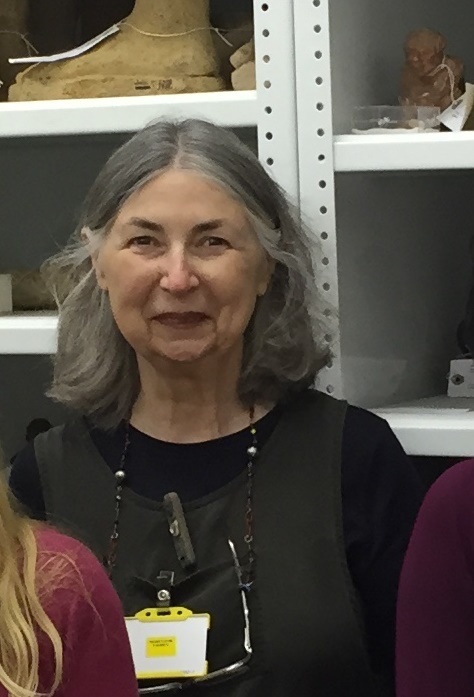 Jean is one of the inaugural members of The Votives Project, and she has written widely on Etruscan culture and religion. In this track, we discuss a variety of votive-related topics, including Greek epigrams, mirrors, anatomical votives (particularly uterus models), animal sacrifice, healing, bronze figurines and the brontoscopic calendar. You can listen to the interview on The Votives Project Podcast Channel or on Soundcloud. We’ve also posted a reading list below, if you’d like to explore this topic further. De Grummond, N.T (2008) ‘On mutilated mirrors’, in M. Gleba and H. Becker (eds) Votives, Places and Rituals in Etruscan Religion, Leideon: Brill, pp. 171-182. Flemming, R. (2017) ‘Wombs for the Gods’, in J. Draycott and E-J. Graham (eds) Bodies of Evidence: Ancient Anatomical Votives Past, Present and Future, London and New York: Routledge, pp. 112-130. Hughes, J. (2017) Votive Body Parts in Greek and Roman Religion, Cambridge: Cambridge University Press. Nagy, H. (2013) ‘Etruscan terracotta figurines’, in J.M. Turfa (ed) The Etruscan world, London and New York: Routledge, pp. 992-1006. Scarpellini, M.G. (2013) ‘The tradition of votive bronzes in Etruria’, in J.M. Turfa (ed) The Etruscan world, Routledge, London, pp. 1026-40. Turfa, J.M. (1994) ‘Anatomical votives and Italian medical traditions’, in R.D. De Puma and J.P. Small (eds) Murlo and the Etruscans: Art and society in ancient Etruria, Madison, WI: University of Wisconsin Press, pp. 224–40. Turfa, J.M. (2006) ‘Was there room for healing in the healing sanctuaries?’ Archiv für Religionsgeschichte, 8, pp. 63–80. ← Shake it till you make it: could votives have been used as rattles?